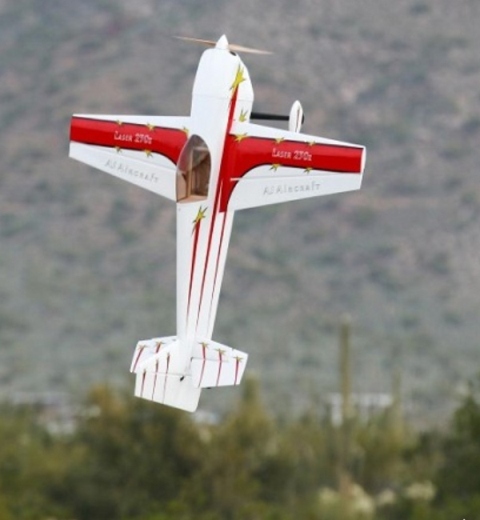 Gashanger.com/GlobalRC - AJ Aircraft Laser 93"
Whether you're looking to go out and go 3d huckin' or lay down a smooth-as-butter precision flight, the 93" Laser 230z is for you! The wings have been thoroughly refined to allow precision flying, while not sacrificing any 3d characteristics. With a generous fuselage height, the model flies as well on its side as it does upright. Generously sized control surfaces give you excellent authority at all speeds. The Laser 230z features an awesomely light but strong airframe and a light wing loading that will handle anything you want it to. Building the airplane is very straight forward. The rudder cables are pre-installed, hinges are pre-installed but not glued, and pre-installed blind nuts in the wing tips for the included SFG's make it easy to get this bird in the air in no time at all.